Rhubarb and swiss chard look a lot alike! Here’s how to tell them apart: the rhubarb does not have a leafy part still attached, but the chard does. Cultivation has been the name of the game this week. From the most basic of weed-killing technologies (hand-weeding) to our new and advanced tractor-cultivation system, Nick and the crew have been busy in the field eliminating every plant except those that we will some day eat. Weeding is a crucial step to growing a successful garden, as any home gardener knows. Why? 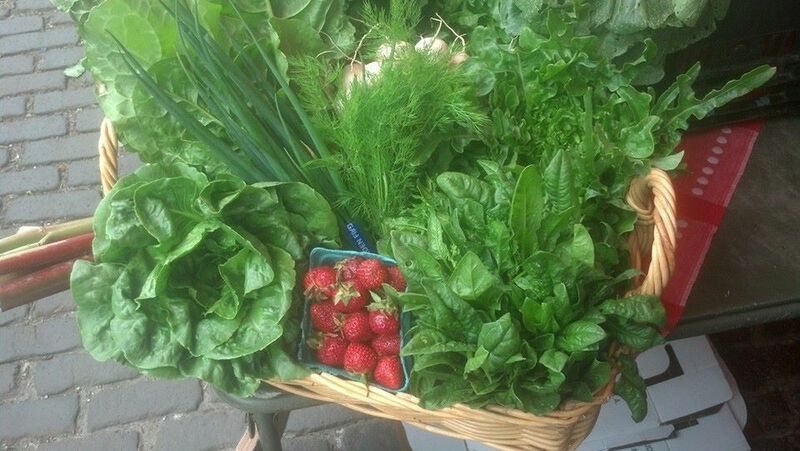 Simply put, a vegetable plant surrounded by weeds has to compete with those weeds for water, sunlight, and nutrients. Take those weeds away, and the plant commands all the resources in its little neighborhood. 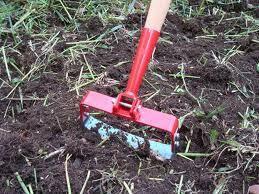 The most tedious way to weed is by hand – literally picking the weeds out of the ground. In the case of small, close-together seedlings, however, hand-weeding is often what is called for. Our work-shares and Adam, Mr. Muddana and Emma all made great strides in freeing up our first round of beets and carrots this week! The next step up in the weed-control regime is the use of hoes. We find “stirrup” or “oscillating” hoes to be the most effective for killing weeds. The operator drags the blade of the hoe across the ground, just below the surface of the soil, disrupting small weeds and their roots. The crews have been hoeing a lot in the past few weeks, as well, and hopefully not developing too many blisters! 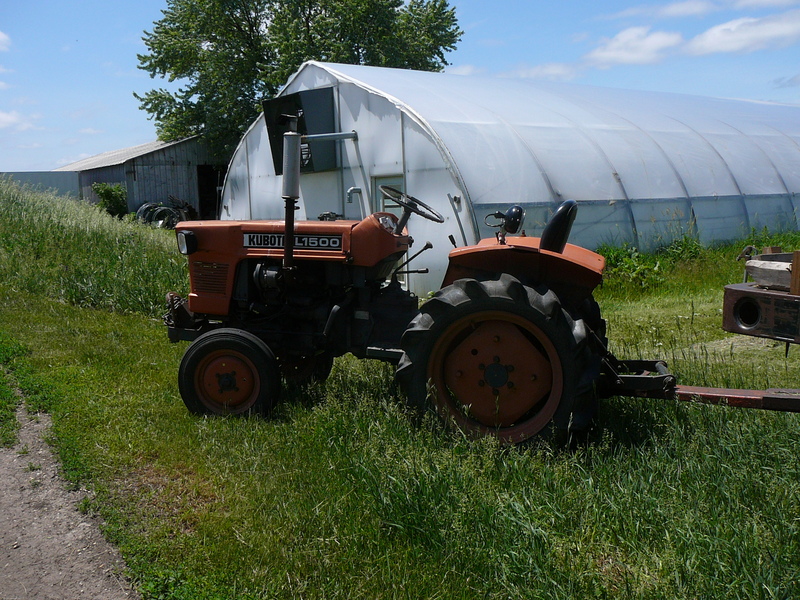 Our most sophisticated, and newest, line of defense against the weeds is our tractor-mounted cultivating system. Thanks to the generous Frontera Farmer Foundation Grant that we were awarded last year, we were able to outfit our Kobota tractor with a range of implements that allow us to kill weeds by driving the tractor and implements up and down the rows. This technique is fast, efficient, and has allowed us to get the field into the best shape ever. We are extremely excited to add this new technology to our weed-fighting toolbox this year. Extra dill can be dried for later use – tie the bunch with twine and hang it upside-down in a dark, well-ventilated place until dry. Remove leaves, and store in an air-tight jar. Dry beans will keep for at least a year in your pantry. Dill is traditionally paired with fish and/or yogurt-based sauces. It can also be snipped into small pieces with kitchen shears and added to green salads. Dill is a good herb to pair with turnip dishes – you can slice the turnips thinly and sautee them in butter, then top with chopped dill. Please see last week’s newsletter for other tips about turnips and turnip greens. Green onions, like chives, are an all purpose garnish or topping. Chop them into thin rounds and sprinkle away! Chard stems are edible and lend a nice texture to a sautee. Remove the hard mid-rib from the leaves and slice into 1/8-inch thick chunks, and then cut the chard leaves into long, thin strips by rolling each leaf up and cutting the roll into thin slices. You can then sautee the midribs and onions or garlic in a little olive oil until soft, adding the leaves in the last few minutes of cooking. Chard can also be eaten raw, in salad form. Toss with your dressing of choice and nuts, dried cranberries, and chopped fresh herbs. This is a good recipe to make if you have turnips left over from last week. Boil or roast turnips till tender. If making a cold salad cool or place in ice bath. Add the first 5 ingredients and mix well. Add the mayo, mix well, and add lemon juice slowly, stirring until the desired thickness of the salad is reached. Add salt and pepper and (optional) bacon or pecans. Add the first 5 ingredients mixing them well. Add the mayo mixing well then start adding the lemon juice 1TBLS at a time till desired thickness of salad is reached. Add salt and pepper and (optional) bacon to taste. To make it a bit spicier add 1TBLS of dijon mustard or 1tsp. of mustard powder or brown mustard seed. Filling: Prepare and cook 1/2 lb. of black beans as desired. Using a knife, cut one half pound of spinach or one bunch swiss chard into 1/2-inch wide strips. Chop about 1/2 c. onion and 2-3 cloves garlic, and combine in a heavy pan with a few tablespoons olive oil. Cook over medium heat until soft, then add spinach and cook until wilted. Add beans, salt, pepper, and red pepper flakes or hot sauce to taste.